This guest post comes from Dr Johann Gregory, Teacher of English Literature and Research Associate at Cardiff University. 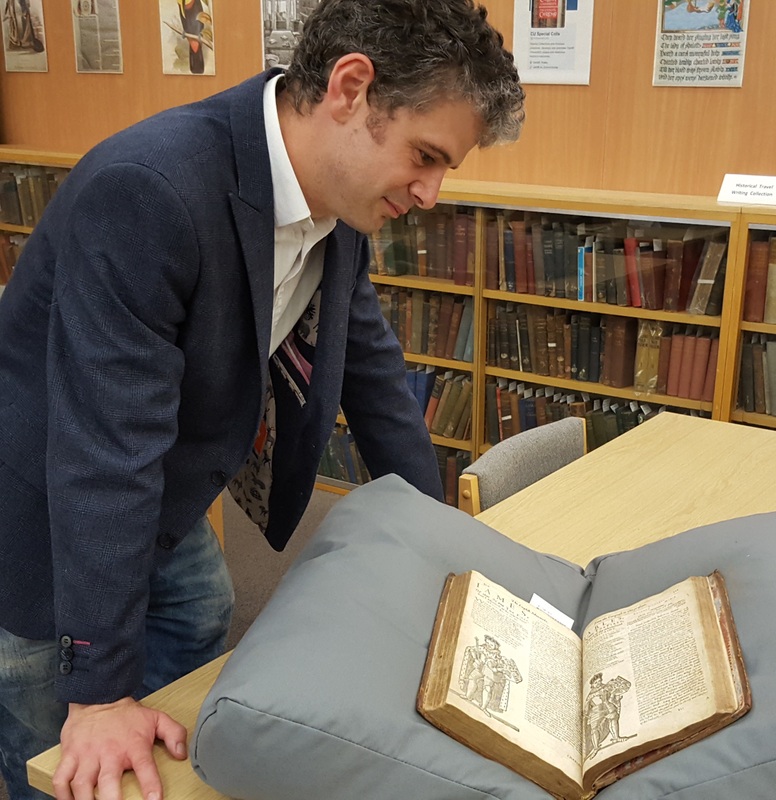 The rare books in Cardiff University’s Special Collections and Archives have held an important place in the development of my research. 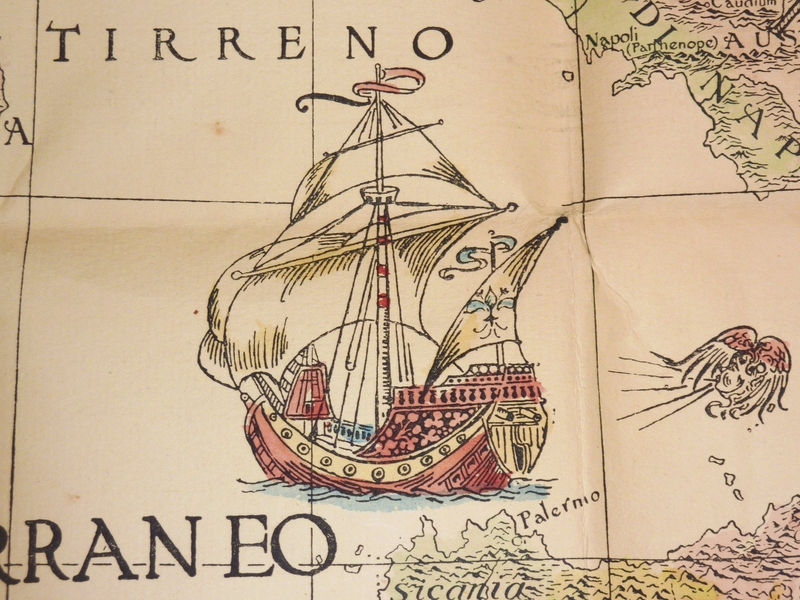 As I launch a new pilot project on an early modern travel writer, I’d like to share that story. 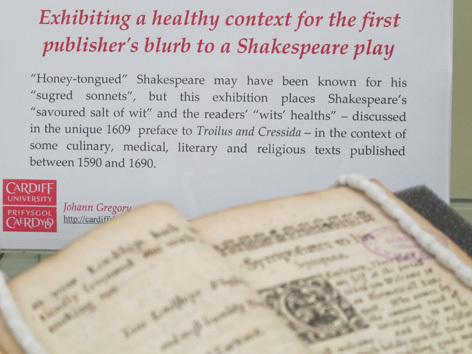 As a PhD student I took part in training workshops on handling rare books and curating exhibitions. In 2011, I was given the opportunity to work alongside Special Collections staff to curate a small exhibition on an aspect of my PhD research. I chose the topic, Healthy Reading, 1590-1690. Focusing on this aspect helped me to contextualise the early printing and language of Shakespeare’s Troilus and Cressida, the focus of my wider PhD research. I later presented on the exhibition and the play during a conference in Paris on ‘Shakespeare et les arts de la table’. My subsequent book chapter on the subject featured images from the Special Collections. I’m very grateful to the Special Collections’ staff, as their support was crucial for this work. 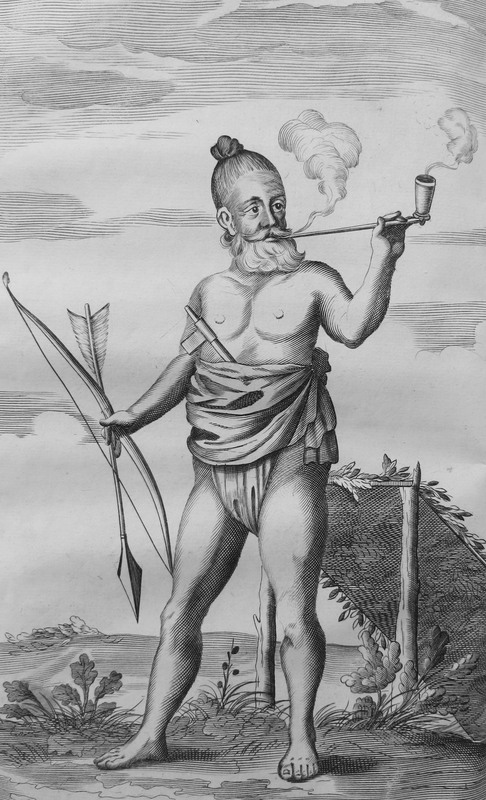 During my research, I became interested in the work of John Taylor (1578-1653), self-titled ‘the Water Poet’. He was a larger-than-life figure who worked as a Thames waterman for much of his life. However, he also published a great deal and his work – ranging from political pamphlets to travel writing to nonsense verse – often includes interesting prefaces, paratexts and titles. 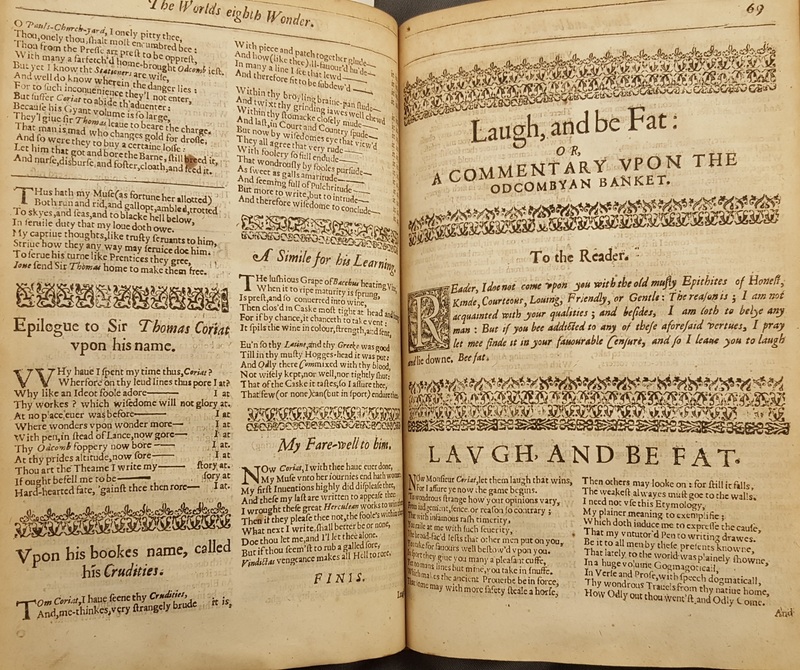 I was excited to find that we held his Works (1630) in Special Collections, and was able to include it in my Healthy Reading exhibition, opening the book on the first page of ‘Laugh and be Fat’: this was Taylor’s response to the work of a fellow traveller, Thomas Coryate, who has been discussed in a previous blog post. It’s always seems to me that Taylor deserves to reach a modern readership, and one broader than scholars in specialist libraries. This year I have developed a new project that seeks to shed light on Taylor’s journey around Wales in the summer of 1652. 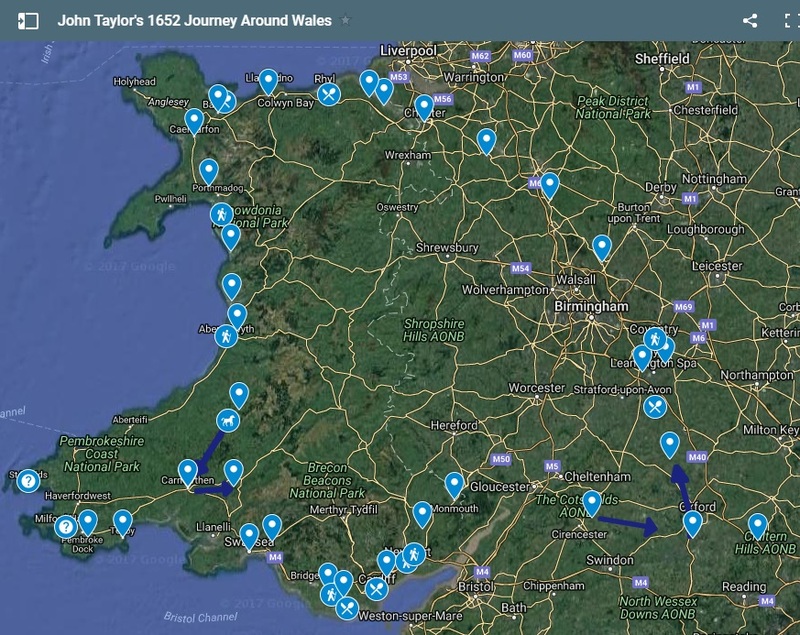 I have created a new online modern-spelling edition of Taylor’s journey around Wales, and this has been published on a dedicated John Taylor website alongside other resources, such as a Google map of the route. I have also produced a schools’ pack on Taylor’s account of Mid Wales. Pupils at Penglais School (Aberystwyth) have used this to consider Taylor’s account of their hometown and have produced visualisations of his journey that will feed into the project. I now plan to tweet his journey in real time. He set off, with his horse called Dun, from London on 13 July, travelling up through the Midlands to North Wales and then along the coast down to Tenby and across South Wales via Cardiff, arriving back to London in early September. During the trip he turned 74. This pilot project is something of an experiment, bringing Taylor to new readers. The aim is that it will also provide proof of concept for future projects on John Taylor and travel writing. For more information about the project, visit the website. Follow @DrJ_Gregory for Twitter updates. This guest post comes from Pip Bartlett, undergraduate in French and Italian in the School of Modern Languages at Cardiff University. In this blog post, I will be sharing some of my discoveries about the Barbier family and their involvement in the First World War. As mentioned in my previous post, the Barbier archive contains several boxes of letters, organised into date order. Five of the grey boxes (1914, 1915, 1916, 1917 and 1918) contain correspondence between the family during the war years. So far, I have catalogued boxes 1914, 1915 and 1918, which have revealed information about the family’s activities, feelings and experiences at the time. I also used two of the booklets created by the previous owner (‘Barbier Voices from the Great War’ Parts 1 & 2) to support any findings I made; they contain very detailed information about each family member’s war experience, as well as including photographs and extracts from diaries. According to ‘Barbier Voices from the Great War Part 1’, prior to the outbreak of war all four of the Barbier brothers had well-established careers; Paul E A. Barbier had been Professor of French at the University of Leeds since 1903, Edmond was the assistant examiner in oral and written French to the Central Welsh Board, Georges was the manager of coal firm ‘Messrs Instone’ and Jules, a civil engineer in North America. Because of their French Nationality, the brothers had completed military service with the French Army well before the war (Paul completed his in 1889), making them no strangers to a military environment. According to the booklet, in August 1914 all four men, along with their brother-in-law Raoul Vaillant de Guélis (married to their sister Marie) were called up by the French state and sent to France. Due to their French-English bilingualism, both Paul and Edmond were mobilised as interpreters for the British Expeditionary Forces. I am unsure if they were seconded from the French army – something I would like to ask the previous owner about in our interview. 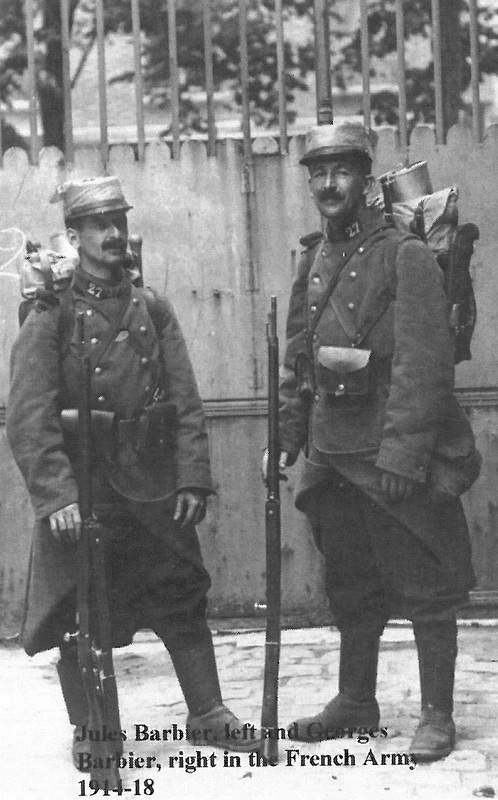 Jules and Georges remained ‘poilus’ (ordinary field soldiers for the French army). Much of the archive from the war years is dedicated to correspondence from Paul E. A. Barbier (or Paul Barbier Fils, as in son, as he is known) to his wife Cécile. From what I have grasped after reading his letters, it seems Paul Barbier Fils had a reasonably ‘comfortable’ wartime experience; that is to say, he regularly talks of eating well and playing bridge with his brother Edmond. In numerous letters, he says he is in ‘good health and spirits’ and regularly returns to the UK on leave, which he documents. According to the letters in the archive, Paul Barbier Fils also remained in close contact with his colleagues at the University of Leeds. For example, there are letters from the Vice Chancellor of the university who asks for Paul’s opinion on various university matters. There is even a letter to Paul dated 29th June 1915 from the Vice Chancellor who says he has been in contact with the French Embassy in London attempting to release Paul from the army, unfortunately without success. I also found letters to Cécile Barbier from wives of other University staff whose husbands were at the front. Cécile served on a committee in Leeds which regularly sent parcels and gifts to University employees in France. Despite his relatively positive account of his wartime experiences in France, some of Paul’s letters to his wife are less cheerful and according to ‘Barbier Voices from the Great War Part 2’, in May 1917 he writes ‘I start writing poetry again […] when I am overcome by sadness’, and in June ‘my intellectual life is a waste land. I long to talk to beings less deadly dull than those around me’. A year later in March 1918 he even says, ‘I am an exile, I am atrociously bored’. To fight these feelings of boredom, Paul evidently focused on his hobbies and interests. Ever the lexicographer (that is, a person who compiles dictionaries, an occupation that was linked to his academic preoccupations), Paul Barbier Fils became fascinated with the local dialect of the region in which he was stationed. He even compiled a dictionary of the dialect entitled ‘Lexique du Patois d’Erquinghem-Lys’, which was later published posthumously in 1980 by the Musée de Picardie in Amiens, France. Georges Barbier, on the other hand, seemed to have had the most difficult war experience out of the family members who went to the Front. In 1916 he returned to London from the front due to illness to work for the Coal Board. In letters to his brothers and mother, he talks of suffering from night-blindness and having very little food, if any. His wife Nan died a few years later, leaving him a widower with two children. Fortunately, the three other brothers who remained in France survived, and in 1919 were demobilised from the army, returning to their peacetime lives in Cardiff. Their brother-in-law, Raoul Vaillant de Guélis was not so fortunate and died of pneumonia in 1916. His wife Marie never remarried and raised her two children along with those of her brother George after his death in 1921. One of her children, Jacques Vaillant de Guélis became a Special Operations Executive (SOE) agent, an undercover spy who carried out missions in France during the Second World War. I do not know much about his life yet, but I am excited to discover more over the upcoming weeks. Finally, while the brothers were at the Front, their younger sister, Isabelle Barbier, spent time in France as a nurse during WW1. 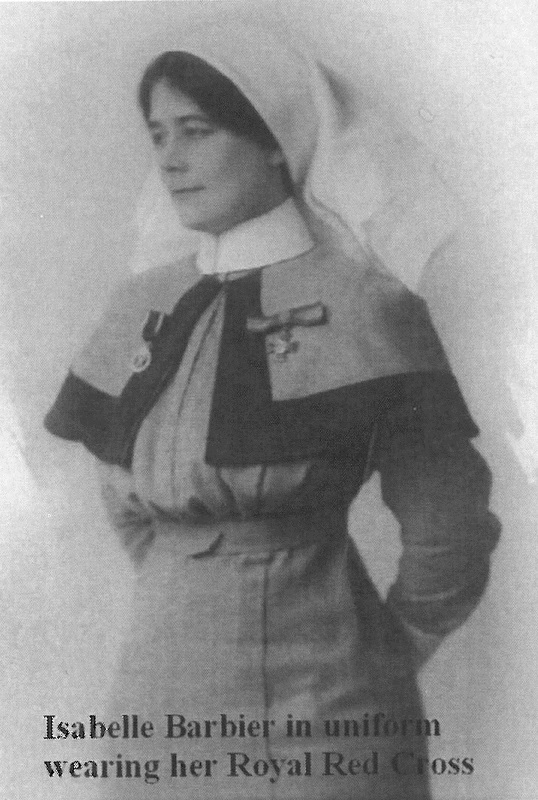 Unlike her brothers, there is little correspondence from Isabelle during the war years throughout the archive, but ‘Barbier Voices from the Great War Part 1’ gives detailed accounts about her time as an assistant to Dame Maud McCarthy, Matron in Chief to the British Expeditionary Forces. 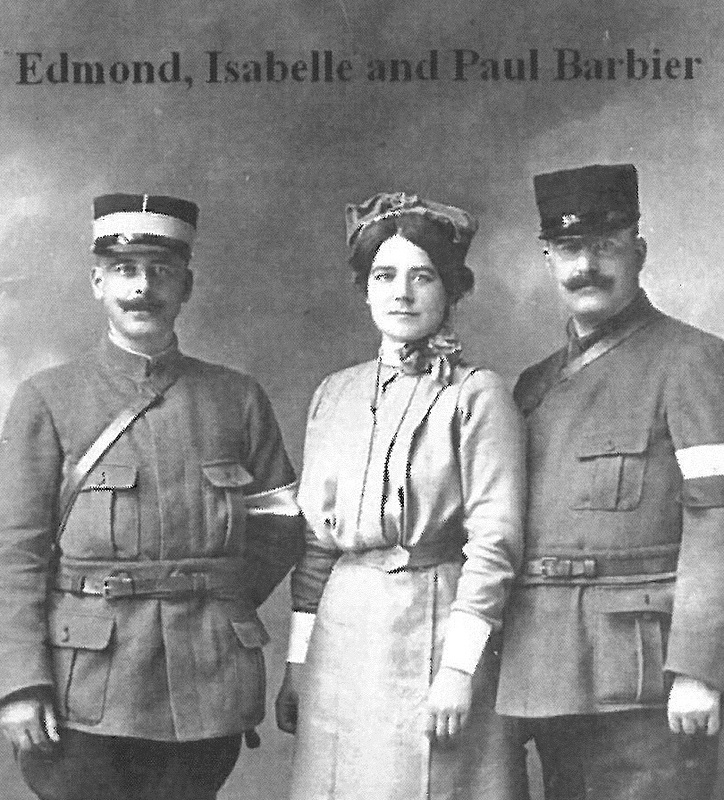 On page 7 of the booklet, there is a lovely picture of Isabelle with her brothers Edmond and Paul, as well as a picture of her in uniform wearing the Royal Red Cross – presumably she was awarded this, but I am unsure when. It is something I would like to find more about when I speak to the previous owner of the archive. All in all, the archive offers insights into the wartime experiences of this remarkable family and it has been particularly fascinating to discover how Paul Barbier Fils continued his interests and worked remotely with the University of Leeds. I hope the former owner is able to answer some of the questions which I have raised, as I feel there are some interesting pointers for future research. Having just completed my third year abroad at l’Université de Genève, Switzerland, and l’Università degli Studi di Parma, Italy, I was thrilled to be nominated to take part in an 8-week placement with the Cardiff University Research Opportunities Programme (CUROP). My task over the eight weeks is to scope the newly acquired Barbier archive, under the supervision of Professor Hanna Diamond, a 20th century French historian, and Alan Hughes, Head of Special Collections and Archives at Cardiff University. Pip working on the Barbier archive. The archive was donated to the university by a living relative of the Barbier family. She believed that the archive would be valuable to researchers, as Paul E. E. Barbier was the first lecturer in French appointed to the University College of South Wales and Monmouthshire, the institution that later became Cardiff University. After visiting the former owner’s home to see the archive, Hanna and Alan were keen to acquire it. The owner has spent time carefully organising and dating the extensive archive. It comprises several large boxes full of memorabilia relating to the family and the Victorian era, including photographs, newspaper cuttings and old exercise books. 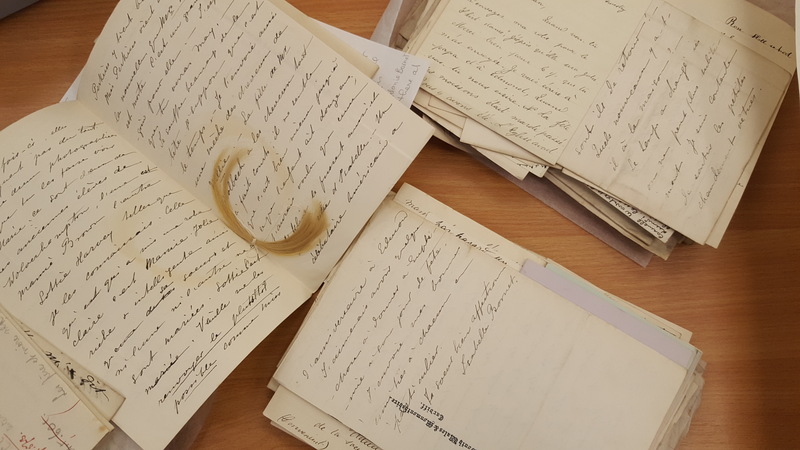 There are also 36 archive boxes, each dated by year from 1860 to 1924, containing hundreds of letters, postcards and other correspondence between members of the Barbier family, as well as their relatives, colleagues and friends. The previous owner has also provided us with a very useful family tree, along with four booklets which she has written detailing the family’s involvement in the First World War. Others outline the lives of Georges Barbier (1819-1892), one of the original members of the family who came to London from the Doubs Valley in France, and Euphémie Barbier (née Bornet), the Swiss-born governess who settled in Cardiff after marrying his son Paul E. E. Barbier. Selection of letters from the archive. My responsibility is to go through the archive with a view to uncovering and recording its contents. I am also collating information about the family to enable the University to promote the archive both to future researchers and interested members of the public. Once settled in Cardiff, the family continued to sustain their French links, often communicating in French with each other, and working closely with various French societies in Britain (the Société Franco-Britannique de Cardiff, for example). The family’s Franco-British identity is very apparent in the archive, as most of the letters from the 36 boxes are in French. I have needed my language skills to read, decipher and translate the letters, which I have then been cataloguing into a spreadsheet so that future researchers have an understanding of what each box contains. Each box of letters takes a while to go through, particularly as there are so many letters, and the handwriting is sometimes difficult to read! In a few weeks’ time, I will be conducting an oral history interview with the former owner of the archive, who I hope will be able to provide more detail and context to the family’s involvement in the First World War, and the different lives of each family member. 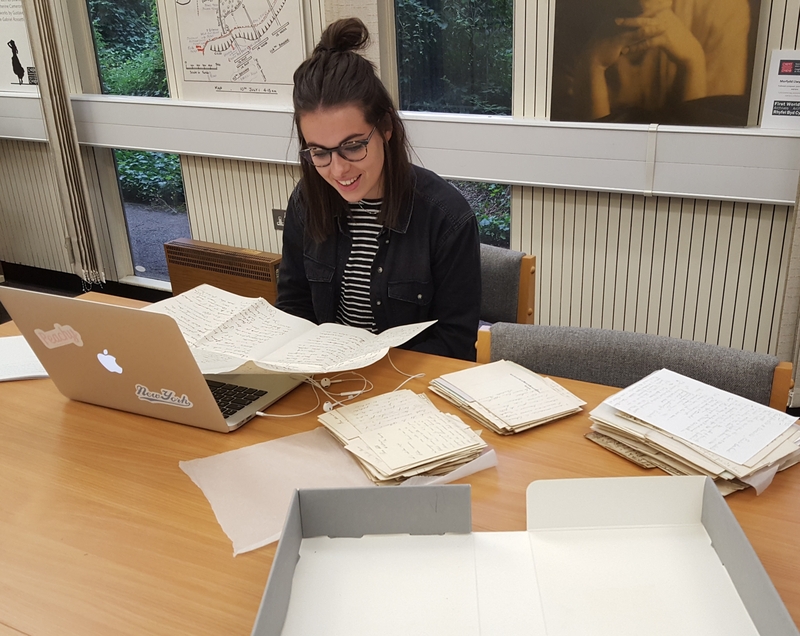 In order to share my discoveries and give a taste of what the archive has to offer, I will be sharing updates via further blog posts and social media. 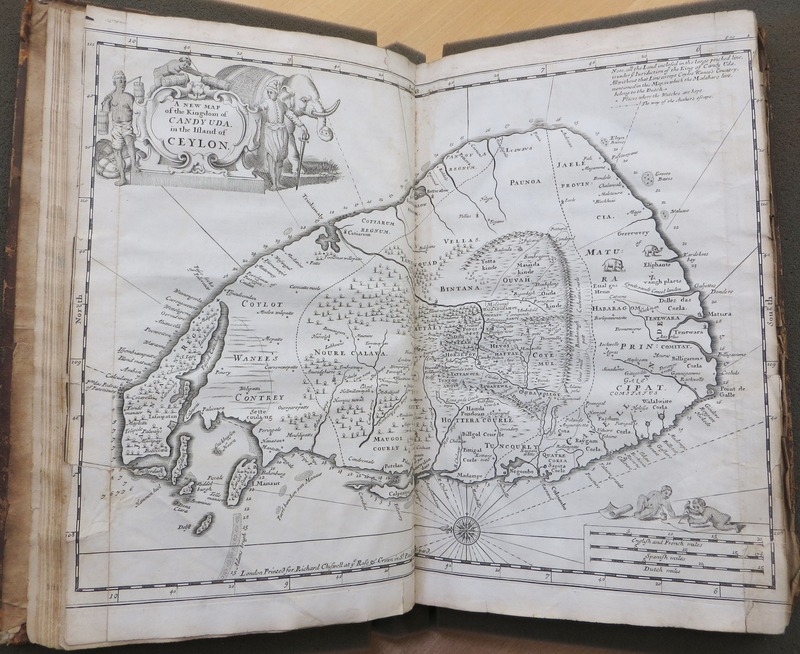 Among the many books on voyages and exploration in the Cardiff Rare Books Collection is a copy of Robert Knox’s An historical relation of the island Ceylon, in the East Indies. 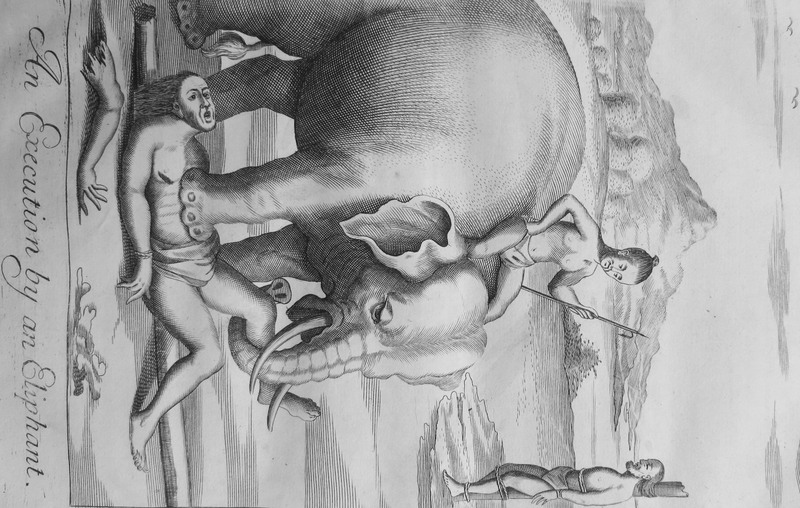 First published in 1681, the work was one of the earliest European accounts of the inhabitants, customs and history of Sri Lanka. How Knox came to write the book is a remarkable tale of adventure, misfortune and daring escapes. Robert Knox was just 14 years old in 1655 when he first joined his sea captain father on the ship Anne for a voyage to India. Three years later, the Knoxes set sail again for Persia in the service of the East India Company but had the ill luck to run into a storm which destroyed the ship’s mast and forced them to put ashore in Ceylon for repairs. 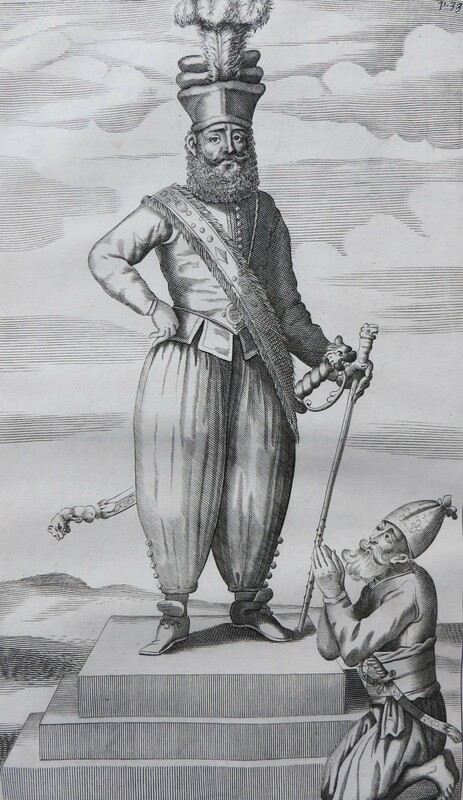 King Rajasinghe II was suspicious of the Europeans’ intentions and ordered the ship be impounded and the Knoxes taken captive along with sixteen member of their crew. The sailors were forbidden to leave the kingdom but otherwise treated fairly, with some of the captives eventually choosing to enter the king’s service. Although Knox refused to work for the king, he was still permitted to become a farmer and make a living. Knox senior died from malaria in February 1661 but Robert remained in captivity for 19 long years before finally making a bid for freedom with a fellow crewman. They managed to reach a Dutch fort on the coast of the island and gain passage to the Dutch East Indies, before at last setting sail for home aboard an English vessel. Knox returned to London in September 1680, having spent the journey writing the manuscript for a book about his experiences. 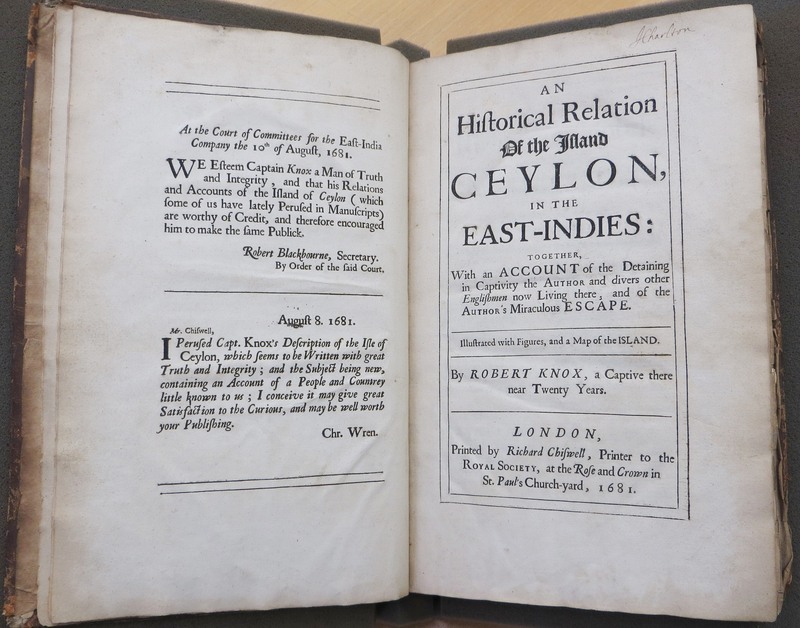 When published a year later as An historical relation of the island Ceylon, the book immediately attracted widespread interest, influencing Daniel Defoe’s famous castaway tale Robinson Crusoe and turning Knox into a celebrity. 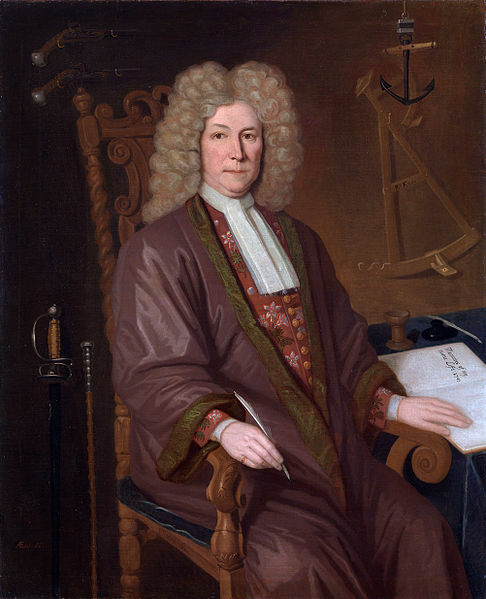 He continued to work for the East India Company for another thirteen years after his return, captaining the Tonqueen Merchant for four further voyages to the East which made him a wealthy man. In 1302 the Italian poet Dante Alighieri, author of the Divine Comedy, was permanently banished from his beloved Florence, the city of his birth. Forced to spend the rest of his life in political exile, Dante travelled throughout Italy wandering from city to city, and was eventually inspired to write about his journeys in the largely autobiographical Commedia. 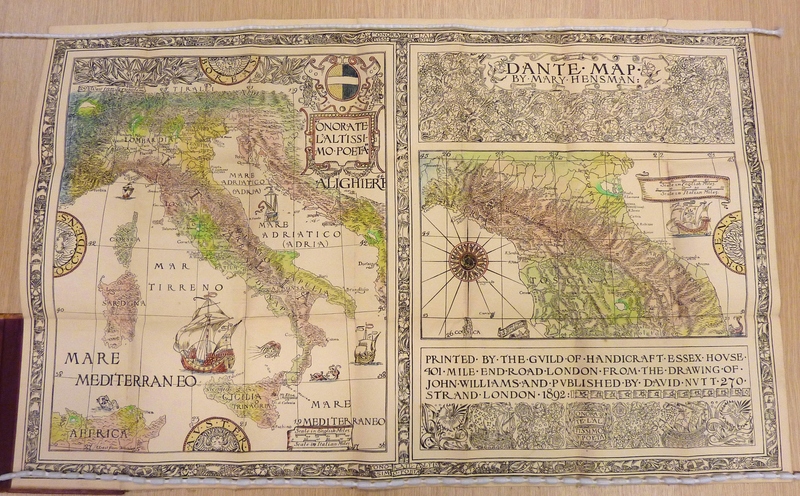 Any scholar hoping to follow in Dante’s footsteps would do well to study these beautiful hand-coloured maps, produced in 1892 by the English artist Mary Hensman and now held in our Private Presses collection. 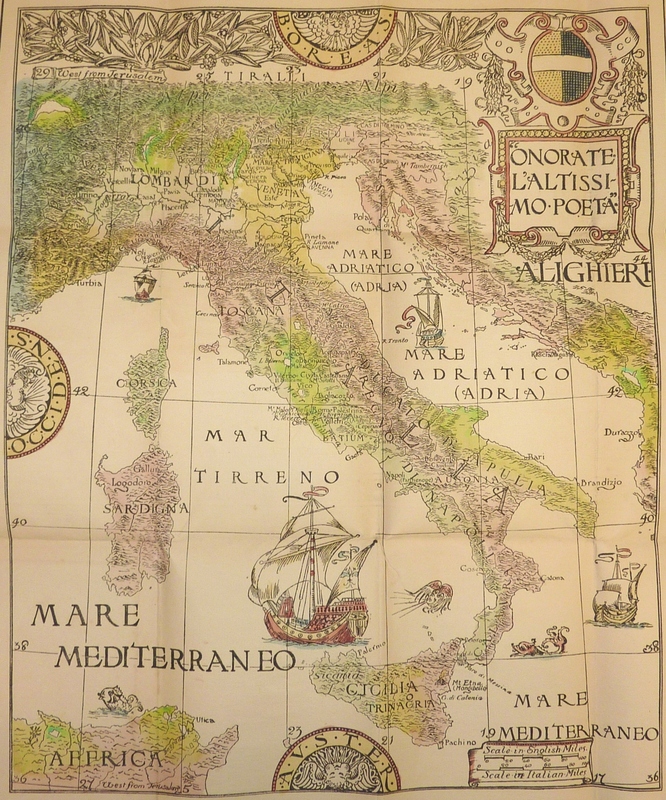 They include all the places supposedly visited by Dante in his exile or named in his works. 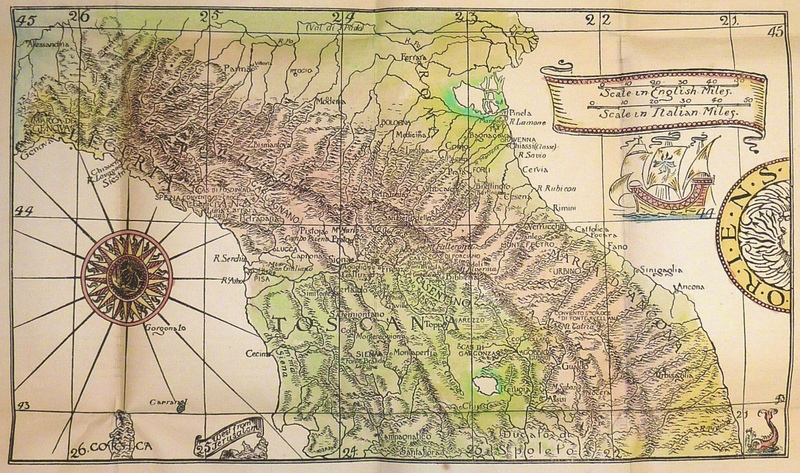 The first map shows the whole of Italy in the time of Dante, “Onorate L’Altissimo Poeta”, surrounded by an elaborate border made up of Guild emblems, while the other highlights Tuscany and central Italy. The maps were produced in London by Charles Robert Ashbee’s Guild of Handicraft as coloured photolithographs, printed on a single large linen-backed sheet and folded into a maroon buckram case with Hensman’s preface and gazeteer mounted on the front pastedown. The hand-colouring was apparently completed by Hensman herself with Ashbee’s assistance.